A giant piece of public art in the Hebrides has been classified as a geographic feature by map-maker Ordnance Survey (OS). The Colonsay Whale is a 160m (525ft) long outline of a whale made of stones at Balnahard on the Isle of Colonsay. The project led by artist Julian Meredith invites people to fill in the rest of the shape with stones. 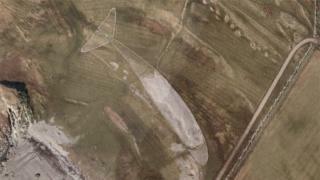 OS has classified the art installation as a hill carving site and added it to its database. The Colonsay Whale joins about 500 million geographic features recorded by OS. Julian Meredith has previously been an artist in residence at Timespan museum and art gallery in Helmsdale in Sutherland and made Helmsdale's Stainless Steel Whale artwork.